There’s a lot to be said for working within limits in order to transcend them. 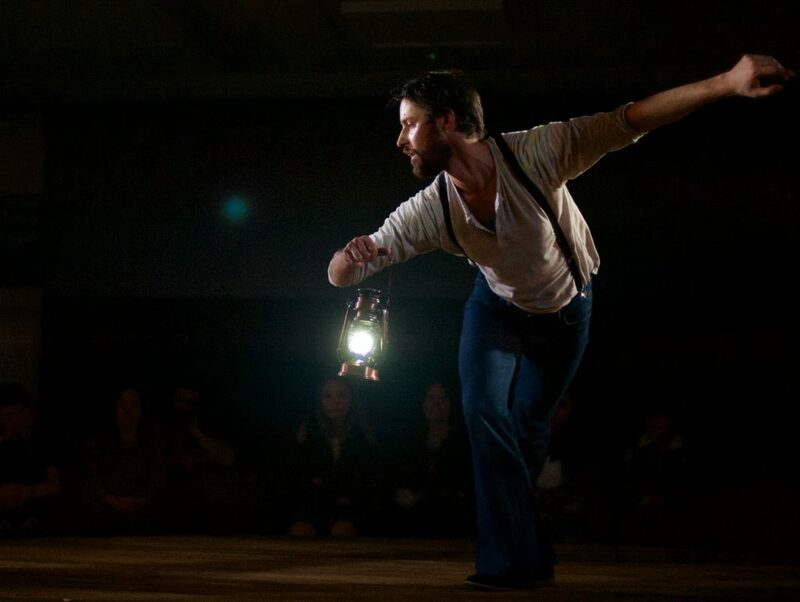 Commissioned by the Rural Touring Dance Initiative, Ben Wright’s Point of Echoes had to be compact, portable and playable in anything from local theatres to village halls. Yet if its resources are small – an ingenious podium that serves as stage, set and storage; self-standing lights; a sound system and three performers – the world it creates is wide and deep, just like the sea that we hear as we take our seats. This choreographed play, narrated through an expedient mix of dialogue, dance, sound and lighting effects, tells of a young man (played by Tom Heyes) who may be on the autistic spectrum. He is sent to work on a remote lighthouse, presided over by a gruff but decent keeper (Dom Czapski). A working relationship develops, signalled by a cooperative but impersonal duet of task-like actions and heave-ho rhythms. But both men are haunted, Heyes by the disembodied voice of his kind but troubled mother, Czapski by the silent presence of his lost wife (Marta Masiero), whose hands he might feel brush his shoulder, and whose figure he hallucinates while drunk on moonshine liquor. When a wrecked boat casts a stranger on their shore, rescue and recovery merge with salty stories of sea monsters rising from the deep, and both men treat the mute, otherworldly creature (Masiero again) as a channel for their own unspoken fears and regrets, blind to the shuddering, disjointed and tormented figure of horror she embodies. It runs to 90 minutes, yet bgroup’s production feels as compact and purposeful as its own set, while its subtle mix of quietness and turbulence tug at the imagination like a tide.